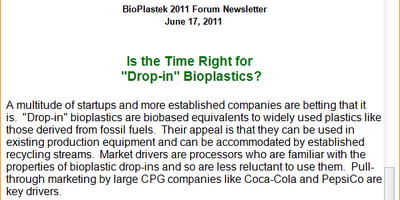 It's the Rheo Thing: Drop-In Plastics? When an email starts out like this: my immediate response is "NO!" (although I certainly would love to answer "YES!"). I group this type of email as equivalent to the Nigerian prince letters. A drop-in replacement? It doesn't take too many years for a chemist or an engineer to discover that there is no such thing as a drop in replacement, especially for a polymer. Despite all the marvelous technical equipment that will allow us to analyze a sample in ways that still can boggle the mind after 21 years in the industry, most of these techniques fall far short of what is needed. (Specifically, I would love to see a tremendous increase in transient rheology, but that is another story for another day.) So regardless of how much a material may seem the same based on the technical data sheet, it won't be, and more importantly, it won't be in the same in some way that is really important to your process - you'll need more heat in one zone, you need to increase cycle time, you need more downtime for maintenance... something will come up, guaranteed. And if it doesn't, then you are a poor unlucky person, as all that luck that you used to make your drop-in replacement occur should have been used to win the lottery. For whatever reason, I did scroll down further and saw that there might be some hope yet. The talk is from Draths Corporation and their bio-based technologies for making monomers. Here's a lower excerpt from the screenshot: This isn't quite as bad as I imagined at first, as creating a drop-in monomer replacement is somewhat easier, although it's always the impurities that kill your product in the reactor. The impurities from a bio-based monomer will be completely different than those from a petroleum/chemical-based one, and that difference could alter any and all of the rates in the polymerization (initiation, propagation, chain transfer...). Removal of impurities can be done, but that adds a real expense to the chemical. with an empirical formula of C6H6O4. C8H6O4, so an extra two carbons need to appear from somewhere. Is that chemistry green? All in all, a "drop-in plastic"? Certainly not.